2009, 281 p. & notes. There’s a striking pamphlet reproduced in the opening pages of Marina Larsson’s book Shattered Anzacs. It’s a recruiting leaflet for WWI, enticingly titled “Free Tour to Great Britain and Europe”. You can see it here. It spruiks “A Personally Conducted Tour whereby you can see the world and save money at the same time” and advises of the wages and separation allowances provided. In best Fawlty Towers tradition, it doesn’t mention the war: only the ‘Great Adventure’. But adjacent to the breezy exhortation to join the tour, it also has a chart of the pensions payable on return to the soldier, his wife and children should there be disablement or death. The consciousness of injury and life afterwards was there right from the start and became even more sobering as men began arriving home. For those who survived, it was most often literally ‘home’, to parents, wives, siblings and children who, as the subtitle of this book notes, found themselves “living with the scars of war”. The book opens with the soldiers not yet back on home soil. From hospitals they wrote to family and sweethearts. Their reassuring letters concealed the extent of injuries sustained and provided an emotional template to guide their families’ reception once the injured soldier arrived home (p. 59). We have all seen the images of the return home- the Welcome Home banners , the crowds craning for a glimpse of their loved one- but we don’t see the stretchers carried off taking a badly injured soldier straight to hospital, or the tubercular soldiers being hustled away to a sanatorium lest the infection be spread to their family. The recruiting pamphlet promised a pension to a totally incapacitated soldier- ah, but there’s the rub. Even in 1920, immediately after the war ended, the 100 per cent war disability pension was set at 4/2/6 for a family of four while the Royal Commission on the Basic Wage recommended 5/16/0 for a comparable family. So, right from the start, returned soldiers were at a financial disadvantage. That was for 100 per cent disability, but over 2/3 of the returning soldiers were assessed at 50 per cent or less. Disabled soldiers on partial pensions were subject to monthly medical reviews, and their pension reduced accordingly. The situation for these soldiers was exacerbated further during the late 1920s and early 1930s during the Depression, when even able-bodied men struggled to find work. Because the Harvester Judgement set women’s wages at 54% of a male wage, there was a limit to how much financial assistance the woman could bring into a home where she was often already doing extra duty as carer. Larsson focuses on two groups of injured soldiers in particular: those suffering from shell shock and those who had contracted tuberculosis. The families of soldiers with shell-shock lobbied hard to have their loved ones placed within the military mental hospitals, separate from the stigma of associating with civilian ‘insane’ patients. Tubercular patients were subject to stigma as well, although this was of a more insidious kind. Within the family, the returned soldier partitioned himself from the rest of the family, while outside the home the fear of contracting tuberculosis made employers wary. Some ex-servicemen transmitted the disease to their families, but the Repatriation Department took no responsibility for them at all. This was the stance that they adopted with all types of injury: that they dealt with the soldier, but not with the family. Larsson’s field of analysis takes her beyond the immediate post-war years into the following decades of the Depression, the failure of the Soldier Settlement program, and the slow disintegration of bodies as old injuries caught up with them. It is important to emphasize though, that this book focuses not on the soldiers, but on the families. Much of the evidence for this book is drawn from the files of government departments, most particularly the Department of Repatriation and the Victorian Department of Lunacy, and the files of various charities established to step into the breach left by official Repatriation policies, in particular the Tubercular Soldiers Aid Society, the Returned Sailors’ and Soldiers’ Imperial League of Australia, the Red Cross and the Sailors’ and Soldiers’ Fathers Association. Although these files contain bureaucratic and statistical information, they also hold the letters of application that families wrote to challenge and leverage financial support of their loved one. This government-down view has been supplemented with oral histories that the author has undertaken with the families of injured WWI soldiers, themselves a rapidly disappearing generation. The oral histories provide a personalized retrospective that brings these injured soldiers out of the sepia into coloured-in, living men, whose injuries affected later generations as well. They form a good counter-balance to the emotion-sodden identification with heroic great-grandfathers that is being encouraged amongst school children in our present-day Anzac commemorations. For all the glory, there was also failure, illness, madness, absence and even violence in the decades that followed the war. The injured WWI soldier has been well captured in fiction and memoir: think George Johnston’s My Brother Jack or The Ghost at the Wedding which I reviewed recently. The stories that Larsson tells here, emerging from the careful and supplicatory prose of the official letter or the oral memories uttered verbally by respondents, do not have the plangency or emotional nuance of a fictional rendering. But that’s not necessarily what you would be looking for in a historical work. You’d look to a historian, rather than a novelist, to pull together the common threads among multiple stories; to piece together the big picture and to alert us to the unusual. Larsson’s footnotes are rather functional, and there’s certainly no alternative narrative being carried out in the footnote section at the back of the book. At times, I admit, I wish that there was a little more interrogation of some of the contextualizing material that introduced the family-based experience. For example, on p.32 she writes that 40% of Australian males aged 18-40 joined up, “yet many more chose not to serve, including 50 % of all single eligible men” Chose? Or on p. 88 in discussing the reasons why women married disabled ex-soldiers, she notes “to gain a pension after the death of the soldier from his injuries”. What evidence is there for this claim? How widely was this believed? I know that a discussion of such points leads away from her major argument, but I found myself eagerly turning to the footnotes for further explication, only to find a bald reference. The book emerged from Larsson’s PhD thesis, and certainly the marks of the PhD genre are still obvious. Chapters start with an engaging vignette; there is a brief synopsis of the thrust of the chapter; evidence is marshalled, and the chapter closes with a summary. There are useful headings, and there is generous use of illustration. While she doesn’t tangle with the specifics of other historians’ arguments, Larsson is at pains to point out the importance of the contribution she is making to the field of Australian History more generally and in particular studies of WW I. She is scrupulously balanced, pointing out that not all soldiers suffered financially or physically on their return from the war. This is not a book that will make you cry. It is too analytical for that. But it will make you bristle at bureaucratic insensitivity, and curse the inhumanity of a government which decided to chop off any sense of ‘entitlement’ as a matter of government policy (something that I suspect we will be doing again). Like all good history books, it brings phenomena out from the shadows in a way that you wonder why you didn’t see them before, and once you’re aware of the issues raised, you continue to see things differently in the future. In the tsunami of Anzac celebration that will engulf us over the next year, that’s a very good thing. 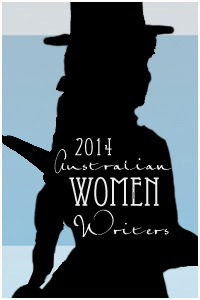 I am posting this as part of the Australian Women Writers Challenge 2014. 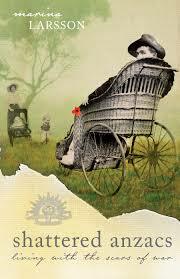 This entry was posted in ANZAC, Australian history, Australian Women Writers Challenge 2014, Book reviews. Bookmark the permalink. Thanks for this review Janine. A better understanding of the effects of WWI is gained by examining the broken lives of the injured soldiers who returned and the effect these had on their families. As you so beautifully put it, these histories are an antidote to the “emotion-sodden” view that Australians are encouraged to have of the war. In fact, is it not a good thing that this book is missing the “emotional nuance of a fictional rendering”? Does the cold gaze of factual truth strip the subject of the emotion that can obscure, not clarify, the essential truth of WWI? In fact I think the emotion you did experience while reading it, your “bristle at bureaucratic insensitivity” and “curse” at the “inhumanity of a government” is the kind of emotion that is appropriate. Your comments on the footnotes are interesting. I think that authors should reward readers by including a few ‘micro-stories’ and asides in the endnotes.